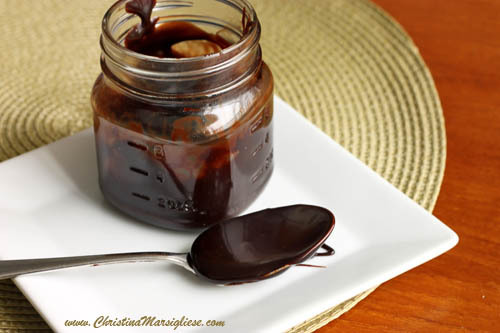 You're probably going to need a recipe for Hot Fudge Sauce to pour all over your Profiteroles. I'm going to give it to you, and I'm going to tell you that you should make it whether you're making profiteroles or not. This stuff needs to be in your fridge all the time. Seriously. You can drizzle it over ice cream and make a killer sundae - whipped cream and cherries are welcome. You can pour it over a layer cake and let it droop over the sides - it would be perfect smothered over a Boston Cream Pie! You can even pour it over any bundt cake to make it way more fun. You can spoon it over cupcakes for a quick and easy glaze-type frosting. Pour it over caramelized bananas with chopped peanuts on top. WIN. Eat it straight from the jar with a spoon. Wait...did I just say that? Yes. Did I just do that? Yes. So wrong. I know. I don't feel bad about it, not one bit. This is the kind of hot fudge that will get really thick on ice cream. I guess it wouldn't be called hot fudge if it didn't. It gets this thick, fudgy texture simply from a good bit of high heat. As the chocolate syrup boils, water evaporates, and the solution becomes more concentrated. This means that the proportion of water-binding sugars is higher, making it super syrupy. If you want a really "hard" sauce, boil it for 6-8 minutes. I prefer 3-5 minutes. It's best to use a pot with a rounded bottom called a saucier because it's built for things that require a lot of stirring, like custards, curds and...hot fudge sauce! The round bottom lets you get your spoon, spatula or whisk into the edges so that you have less risk of burning. The pouring spout is also great as it creates less of a mess when you're transferring to a bowl or a container. This saucier in particular provided even heating and it was light enough that pouring with one hand was easy. 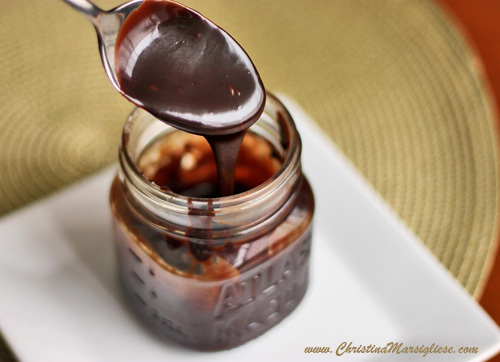 I'm telling you...this Homemade Hot Fudge Sauce is the real deal. The store-bought stuff....let's not even discuss it. Not necessary. It keeps in your fridge in a sealed jar for weeks so you can enjoy it anytime and whip it up in a matter of minutes. I bet you have all of the ingredients on hand too, don't you? Oh, I love hot fudge sauce on anything too. @Debs @ DKC Would you pour it over brussel sprouts? I totally would. Oh this looks incredibly rich and delectable!!! YUM! @briarrose It's dangerous, but it's so worth it. I'm with these girls... major droolige going on over here. This would be a temptation if it sat in my fridge that might be overwhelming! Looks delectable! I have made this three times in the past two weeks. I tripled it the last time. I have a container just for eating with a spoon and one for ice cream. It's absolutely lovely!